I wish I had a better 'before' picture of this room for you. Something more than a half painted wall to show you what it looked like. I don't even have one from the walk through I don't think - it was the previous owner's daughter's room, and they didn't post any pictures of it on the listing, and I never took any. Once we moved in, it was always just an empty room, so we never went in there. The walls were a dusty rose (or as I call it, dirty pink) and the only room of the entire house where I hated the paint color. I think in the back of our mind we always knew it would be a future baby's room, whenever that happened to be. In fact I often referred to it as the baby's room. It was better than "the extra bedroom that isn't the guest room, and isn't the craft room, you know the ugly one with the gross pink walls?" So when we found out that this hypothetical baby was a little less hypothetical, one of the first things we did was pick out paint colors. I've never been a "blue for a boy's room and pink for a girl's room" kind of person, so not knowing the gender didn't stop us from deciding on colors. It's probably obvious that Tom and I have a thing for any sort of blueish-green color. Aqua, teal, turquoise... we used them in our wedding, and you're probably not shocked we picked something in that color pallet for that baby's room. It felt right, since the room was so small and dark looking, we really wanted something fresh and light. In fact, the color is called fresh mist. Doesn't that sound like a color you want on the wall of your bedroom? Also because we can't ever just do the simple thing, we decided on an accent wall too. We didn't want to be overwhelmed by the fresh mist color, and having a darker color on the back wall would hopefully add to the illusion that the room was a big bigger/deeper. So we picked a nice greyish color (Voyage in case you're interested) for that wall. 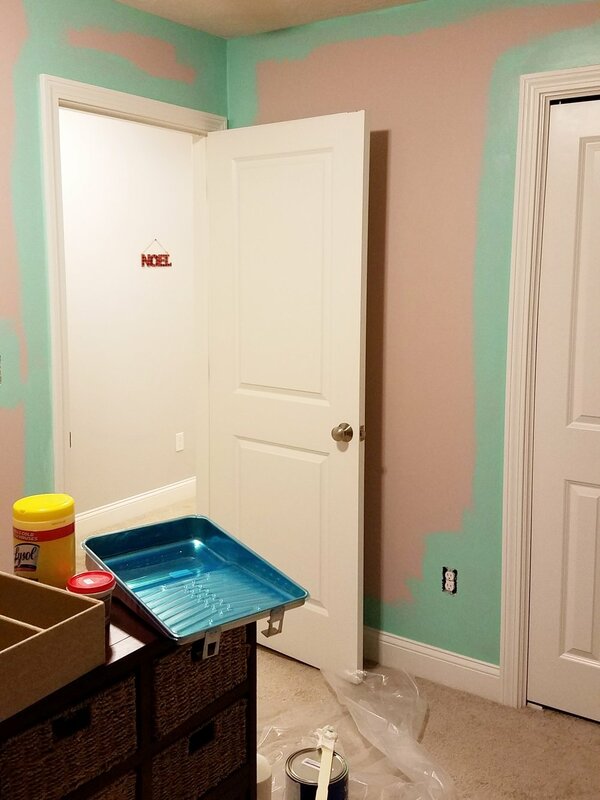 It's almost humorous how early we started painting that room compared to when the baby is due, but if I tell you it took us almost 2 months to finish it after we started, maybe that makes more sense! I knew it wasn't going to be a simple weekend project, so starting early is never a bad thing. And I say finished, but really I'm just talking about the painting (which I LOVE how it turned out!). Notice the title of this post is only 'round I' haha. It actually probably could have been round I and round II, since after painting was finished, we even managed to hang curtains! This is officially the first room of the house to have curtains hung! We have a long way to go with the rest of the house, but in comparison to the picture above right with the ugly dark blinds, I think it looks a lot better! Granted I need to hem them still (and figure out how to use my sewing machine), but we're getting there. And we actually have an update on the crib too! Tom's parents have generously offered to take care of that for us, so now that we have the perfect space for it, that might be the next update you see. Of course we still have to choose one which may take us forever, but hopefully we can narrow that down soon. I even hung something on the wall the other day! I have no idea what else is going on the wall or where, but it's a start!